Fraud at Washington Post Inc.
Arlen Castillo had just begun an online associate’s degree program at Kaplan University when a family emergency forced a change of plans. Her mother in Florida learned she needed extensive surgery that entailed months of recuperation. Only two weeks into her first term, Castillo promptly withdrew to lend her mother support. As Castillo recalls, a Kaplan academic advisor told her she could simply fill out a withdrawal form and incur no additional expenses beyond the registration fees she had already paid. But a year and a half later, in 2006, collections agents began hounding her, she says, demanding that she pay some $10,000 in supposedly overdue tuition charges. Despite having attended only two online sessions, Castillo had remained officially enrolled at Kaplan for nearly a year after her withdrawal. Far from an aberration, Castillo’s experience typifies the results of a practice known informally inside Kaplan as “guerilla registration”: academic advisors have long enrolled students in classes they never take, without their consent and sometimes even after they have sought to withdraw from the university, in order to maximize the company’s revenues, according to interviews with former employees. Managers at Kaplan–the highly profitable educational arm of the Washington Post Co.– have for years pressured academic advisors to use this method to boost enrollment numbers, the former employees said, offering accounts consistent with dozens of complaints filed by former students with the Florida Attorney General’s Office and reviewed by The Huffington Post. Guerilla registration has been part of a concerted effort by the university to keep students enrolled as long as possible in order to harvest more of the federal financial aid dollars that make up nearly all of the company’s higher education revenues, according to former Kaplan academic advisor Sheldon Cobbler, who described the practice in detail. Most advisors had access to a company database that allowed them to view students’ e-mail correspondence without their knowledge, said Cobbler, who worked at Kaplan’s Fort Lauderdale, Fla., corporate office from 2007 through July of this year. The advisors routinely searched through students’ e-mails to look up their user names and passwords for Kaplan’s enrollment system, and then they used that information to sign in using multiple student identities, enrolling them in classes they never intended to join, he said. Kaplan denied claims that it has engaged in so-called guerilla registration, branding as “false” and a “complete mischaracterization” allegations that it has signed students up for classes without their knowledge. Kaplan declined requests for interviews with senior company executives. Guerilla registration would appear to constitute criminal fraud, said a senior official with the Department of Education, who spoke on condition he not be identified in response to The Huffington Post’s description of the practice. The official–who did not confirm the use of the method, but merely characterized its legality– said it could also trigger criminal penalties under the Federal False Claims Act, which bars the submission of improper claims for government funds. Cobbler said he did not himself engage in guerrilla registration, but was well aware of its prevalence at Kaplan through conversations with colleagues and discussions with middle managers who told advisors to continue registering students for classes even after they attempted to withdraw. He said guerilla enrollment was an unwritten company practice, but Kaplan management tacitly encouraged academic advisors and admissions recruiters to employ it to increase official enrollment numbers. He said students who remained enrolled often did not even notice that they had been covertly registered for additional classes. Cobbler was fired from the company last July, he said, after raising concerns about recruiting practices and a lack of academic support services for struggling students. He had already been seeking other job options, he added, because he felt uncomfortable working for an institution that valued profit above all else. Cobbler’s description of Kaplan’s internal operations is consistent with those of other former employees, who described the company as a machine aimed at getting students–and their federal loan dollars–in the door, with little regard for their academic progress or career advancement. Kaplan systematically padded the tuition bills of many soon-to-be graduating students, requiring that they pay their balances in full before they could obtain their diplomas and transcripts, said Jermaine Johnson, a former financial aid officer at Kaplan’s Fort Lauderdale office. Johnson, who worked at Kaplan from the spring of 2008 until two weeks ago, when he was laid off, characterized the practice as an accounting gimmick: By billing students directly, he said, Kaplan conveyed the appearance of satisfying federal requirements that at least 10 percent of tuition be paid through sources other than federal financial aid dollars. And that enabled Kaplan to capture up to 90 percent of its tuition payments directly from federal sources such as grants and subsidized student loans. The Kaplan spokesman questioned the motives of those who have come forward to criticize the company’s operations, while asserting that negative accounts reflect the views of “disaffected former employees” and a handful of aggrieved students. “The experiences of these students is hardly representative of the more than 375,000 students and graduates served by Kaplan Higher Education schools over the past decade,” the company declared in a statement. Kaplan University is part of a thriving industry known as for-profit higher education, which runs the gamut from traditional campus settings offering specialized degree programs to online courses. Scrutiny of the sector has intensified in recent months, as evidence has mounted that many institutions make extravagant promises about the value of their programs while leaving students with enormous debts that many cannot repay given the low-wage jobs they tend to secure after graduation. Concern about the practices of for-profit colleges has amplified as their enrollments have swelled–particularly in recent years, as the Great Recession has produced legions of jobless people seeking to gain an edge through higher education, and as the Obama administration has sharply increased the availability of federal student aid. Over the past decade, enrollment in the for-profit sector has more than tripled, billowing from under 900,000 students in the 1998-99 academic year to more than 2.8 million students in 2008-09, according to a recent report from The Education Trust, a student advocacy group. Over the same period, enrollment at public and non-profit universities and colleges grew by only about one-fifth. Average annual profits for publicly traded for-profit education companies grew 81 percent between 2005 and 2009, according to reports released this year by the Senate Health, Education, Labor and Pensions Committee, reaching a collective $2.7 billion. Most of that money has come courtesy of the taxpayer: The for-profit college sector relies almost entirely on federal student aid, with many institutions receiving between 85 and 90 percent of their revenues from aid dollars. Although for-profit colleges comprise only about 10 percent of college students nationwide, the industry takes in nearly a quarter of the money set aside for federal higher education grants and loans. But while that revenue stream has proven lucrative for the profit-making conglomerates that run the schools, students and taxpayers have seen more questionable benefits. Over a period of three years from 2006 through 2009, more than 20 percent of students taking out loans from for-profit colleges have gone into default–double the percentage of students who took out loans from public universities, according to data released by the Department of Education this summer. Students at Kaplan-owned campuses had among the highest three-year student loan default rates of all the publicly traded colleges in the industry: more than 27 percent, according to an analysis of the Education Department data. Kaplan and other for-profit colleges acknowledge the higher rates of default but maintain they are an outgrowth of a public service they perform in enrolling higher risk students from lower-income backgrounds, students who have traditionally been been overlooked by other institutions. For-profit colleges now face the prospect of new rules being crafted by the Department of Education that would restrict their access to federal aid dollars if too many of their students fail to repay their loans or if graduates wind up with greater debts than they can manage given their resulting wages. The new rules–which the industry vigorously opposes–have been aimed at curbing the sorts of aggressive recruitment and financial aid practices that the former Kaplan employees portrayed as typical inside their institutions. They described a blistering workplace environment in which recruiters, financial aid officers and student academic advisors have together focused on two goals: enrolling as many students as possible and doing everything to ensure those recruits don’t leave. Similar accounts have emerged from other for-profit education conglomerates, including the Apollo Group, which owns the University of Phoenix, and Career Education Corp. But Kaplan stands out as a special case, given its affiliation with The Washington Post, one of the most respected names in American journalism and an institution that presents itself as an agent of public good. A decade ago, Kaplan was best known for its standardized test preparation classes, but its higher education division has since grown more than ten-fold. Last year, Kaplan higher education posted revenues of more than $1.5 billion, far eclipsing those of the test preparation division and The Washington Post newspaper itself. In short, a corporation named for a newspaper that gained acclaim by holding the powerful to account now derives its largest slice of profits from an enterprise that some liken to a predatory lending operation. According to former Kaplan employees, the company’s methods in attracting and retaining students often collide with basic ethics. Students who have enrolled in online classes while posted to military bases have been pressured to continue their studies even after being shipped off to active war zones, they said. Academic advisors often urge students to fail classes instead of withdrawing, they added, so they will then have to retake classes, enabling Kaplan to capture additional tuition. Though the company’s training manuals prescribe ethical conduct, the day-to-day realities inside Kaplan present a stark contrast, the former employees said. “The first thing I picked up on easily was that what we’re saying and doing in training isn’t really aligned with what was said and done on the floor,” said Tom Corbett, a former director of admissions in Kaplan’s Phoenix office, who worked at the company from August 2008 through June 2010 until he ultimately decided to leave because of what he termed “observed unethical business practices” and a “numbers-focused” admissions process. When Castillo set her sights on a business associate’s degree at Kaplan in early 2005, she had one thing on her mind: convenience. The online curriculum suited her full-time work schedule, she said, and the financial aid options outlined by her advisor sounded manageable. A combination of federal Stafford loans would fully cover the tuition costs. But news of her mother’s impending surgery upended her plans. Learning of the long recovery time–at least six months–Castillo knew that caring for her mother would cut into her free time. So she filled out a release form, withdrew from the course, and assumed that was the end of her association with Kaplan. But in June 2006, she began receiving calls from collection agents representing the Department of Education regarding a $10,549.69 balance for her student loans: more than $7,000 for tuition, $1,400 in interest and $2,000 in collection costs. She protested, and she called the education department in Washington to report that she had withdrawn from Kaplan long before such charges would have been justified. The response she eventually received was troubling. According to the Department of Education, paperwork filed by Kaplan on her behalf indicated that she had remained enrolled in her online program for nearly a year. More importantly, records showed she had completed 60 percent of her coursework–a crucial threshold. Once a student reaches the 60 percent mark, the college can keep all of the federal financial aid, leaving the student on the hook for balance. Given that many Kaplan courses run only 10 weeks, that requirement can be met in as little as six weeks. Castillo’s experience typifies those described in complaints filed with the Better Business Bureau, on Internet consumer forums and at the Florida Attorney General’s office, which is now investigating Kaplan and other for-profit schools for alleged misrepresentations regarding financial aid and deceptive recruitment practices. In November, Kaplan instituted a new program offering new students a chance to enroll in courses on an introductory basis lasting up to five weeks, with the right to withdraw without further financial obligation. Asked whether that program was a response to allegations that Kaplan has gamed the system–keeping students enrolled until the six-week mark to justify keeping their federal financial aid dollars–the company spokesman said it was instead a way to help prospectives make good decisions. “It is a way that we can assure them, and we can assure ourselves, that we have the right students in the right classes,” Harrad said. Former employees said they confronted sustained pressure from management to keep students enrolled at the university for at least 60 percent of the length of their courses, no easy feat in an atmosphere where most students have traditionally departed after little more than a year, according to a recent Senate report. Former admissions officers say they labored under an imperative to enroll as many students as possible, regardless of their qualifications or the likelihood they would succeed. Former academic advisors–who were supposed to be helping students make wise choices–say they felt constant pressure to keep students enrolled, regardless of all other considerations. Incentives have been tied directly to paychecks: Admissions advisors have been subject to monthly enrollment quotas that continue to escalate the longer they work there, the former employees said. Managers track employees’ progress on dry-erase boards visible to the entire office. A missed monthly recruiting target can lead to termination, they said. The methods used to boost those numbers featured a creative set of pitches that often took liberties with the truth, the former employees said. “It was ‘Say anything, do anything,'” Corbett recalled. 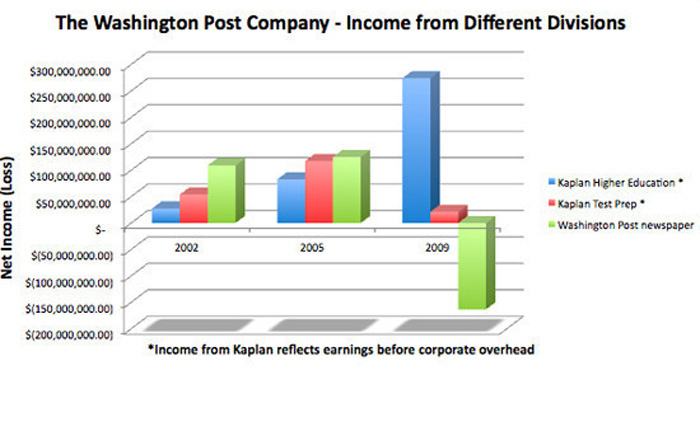 According to former employees, admissions recruiters frequently touted Kaplan as a prestigious and credible institution by noting its pedigree: It was owned by The Washington Post. Meverden, the Florida recruiter, usually worked with military recruits–a particularly desirable population for for-profit institutions because their federal aid does not count toward a cap on how much the colleges can collect via federal student aid. He says he often overheard other recruiters telling prospectives in the military that Kaplan’s program had the de facto seal of approval from the Pentagon and was specially designed with their needs in mind, when neither of these claims was true. He says he also overheard colleagues promising military recruits they could enroll without paying anything–the government would pick up the whole tab–when in fact they would typically be required to pay as much as one-third of their tuition. Meverden and another former recruiter, Leonard Stillman, say they were fired for not hitting monthly recruitment targets. Stillman said he felt compelled to enroll students who had little chance of succeeding based on their prior academic experience. Either that, or miss his numbers. In recent months, Kaplan has sought to blunt such criticisms by changing its compensation policies. The company has never evaluated admissions officers purely on the basis of how many students they recruit, claimed the company spokesman, directly contradicting the accounts of former employees. Three months ago, Kaplan stopped considering recruitment numbers at all in its evaluation of admissions staff, Harrad said. Kaplan now measures their performance based on attendance and their skills in discussing the company’s course offerings, he added. Once students were in the door, the pressure to keep them there became intense, said Cobbler, the former academic advisor in Fort Lauderdale. Toward the end of his time at Kaplan, Cobbler said the academic advising office had essentially transformed into a call center, with advisors hounding students up to six times a day if they weren’t attending classes. When Jennifer Davis tried to take a leave of absence from an online Kaplan course during her first term there in the summer of 2006, she encountered what she portrayed as extraordinary pressure to remain. She had been pursuing a bachelor’s degree in paralegal studies, and was already more than 60 percent of the way through when she learned that her husband– who had been in the hospital for severe pneumonia and emphysema– might have to be induced into a coma. Wishing to be by his side, she attempted to arrange the leave. She understood that she would be on the hook for the cost of the first term, but she wanted to cease any further expenses. But when she called and e-mailed her academic advisor, Dimitra Jackson, requesting a withdrawal or leave of absence, she was swiftly denied. According to an e-mail she received from her advisor, Davis was not entitled to a leave because she had not been enrolled at Kaplan for at least two consecutive years. Davis’ advisor subsequently sent her an e-mail informing her that Kaplan was going ahead and registering her for classes in the next term. In numerous calls and e-mails sent to Jackson over the following month, Davis attempted to put a halt to her continuing enrollment, but was repeatedly rebuffed. A week later, Davis received a an e-mail from her advisor stating that she had to discuss the matter on the phone before anything could be resolved. According to Davis, during a subsequent telephone conversation, Jackson told her that if she simply stopped attending classes, she would be dropped from the enrollment and face no additional charges. But a year later, Davis received a bill for more than $3,400 in unpaid tuition – more than twice what she actually owed for the classes she took, she says. Jackson did not return phone calls and e-mails seeking her comment. The Huffington Post provided Kaplan with the details of Davis’ complaint and those of five other students, but the company declined to discuss any of those cases, citing privacy restrictions. In a generic statement, Kaplan placed the blame for student complaints on the students themselves, asserting that they made errors in filling out forms for federal student aid. “Each had issues related either to their financial aid eligibility or to the documents the government requires,” the statement said. As Priscilla Williams neared her graduation date from an online Kaplan course in the spring of 2009, she was under the impression that all her bills were paid, she says. When she first enrolled in the program, a financial aid packet sent by Kaplan assured her that her entire tuition would be covered by two major forms of federal student aid: Pell grants, which need never be repaid, and Stafford loans, which generally carry low rates of interest and are payable after graduation. But just before her graduation date in April 2009, Williams says Kaplan’s accounting department informed her that she owed more than $5,000. That sum was due immediately, and until she paid, she was ineligible to receive her diploma, Williams recalled. She could not even receive a transcript. According to Williams, Kaplan also told her that a previously-accepted credit from a community college no longer counted toward her degree requirement, necessitating that she complete additional coursework–at additional expense. Williams was both confused and dismayed. She had enrolled in the program, seeking a bachelor’s in business administration, precisely because she hoped this credential would give her more opportunities to boost her income in Delaware’s real estate business. Now, her credential was being denied until she could come up with a sum of money that she lacked. Williams has submitted formal grievance letters to the university, the Better Business Bureau and the Florida Attorney General’s Office. She has requested detailed accounts of why student loans did not cover her costs as promised, she says, complaining she had yet to receive a satisfactory answer from Kaplan. Shortly after graduation, Williams was laid off from her job at a real estate agency. Without a diploma or a transcript proving that she completed her bachelor’s degree, she was forced to apply for lower-paid work as a leasing agent, eventually accepting a position that pays some $17,000 less a year–nowhere near enough to pay what Kaplan claimed she owed. Johnson, the former Kaplan financial aid officer, expressed confidence that Williams’ experience was no accident. He routinely saw student’s financial statements altered by Kaplan’s business office in Alpharetta, Ga., with zero balances suddenly turned into four- and five-figure balances without any them registering for additional courses–always right before graduation. This entry was posted in CAPITALISM, EDUCATION, GOVERNMENT, NEWS, POLICY. Bookmark the permalink. One Response to Fraud at Washington Post Inc. Thanks a lot for the entry, I actually learned something from it. Really good content on this website. Always looking forward to new article.